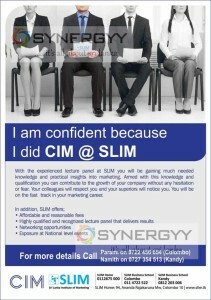 Srilanka Institute of Marking (SLIM) a leading Marketing professional body in srilanka offers lectures for the Chartered Institute of Marketing in Colombo and Kandy Branch. With the experienced lecture panel at SLIM you will be gaining much needed knowledge and practical insights into marketing. Armed with this knowledge and qualification you can contribute to the growth of your company without any hesitation or fear. Your colleagues will respect you and your superiors will notice you. You will be on the fast track in your marketing career.